Sule impressed as Bohemians beat Shamrock Rovers in Tallaght for the first time in five years, as well as league leaders Cork City in Turners Cross. Sule has made 18 appearances for Bohemians in the Premier Division this season. BOHEMIANS MIDFIELDER Fuad Sule was today named SSE Airtricity League/Soccer Writers’ Association of Ireland Player of the Month for July. The player has been a constant presence for Bohemians this year since signing from St Patrick’s Athletic, featuring in 18 of Bohs’ 25 Premier Division games this season. In July he played in every game as the Gypsies won two, drew one and lost three of their six league outings, impressing consistently as Keith Long’s side defeated Shamrock Rovers and league leaders Cork City back-to-back. The player’s battling performances, particularly in that 2-1 Dublin derby win in Tallaght two weeks ago have impressed Bohs fans and the wider League of Ireland fanbase in equal measure. On receiving the award, Sule admitted he was surprised that a more defence-minded player took the accolade, given past winners featured goal-scoring forwards such as Sean Maguire and Patrick McEleney. “I’ve looked back at past winners of this award and it’s usually been goal scorers or more attacking players. It’s good to see the other side of the game recognised too,” he said. A 0-0 draw at home to Bray Wanderers last Friday means his side are eight points above the bottom three. A margin, the player says, which needs to be added to with three sides facing relegation. Speaking to The42 in May, the player said he had offers to sign for other clubs at the end of last season, but Bohemians offered a platform for him to grow as a footballer. “I just felt at this stage of my career I have to be playing first team games and when you want to go where I want to go, you have to be playing every week and making an impression,” he said. Sule fended off competition from former Cork City striker Maguire, who finished second in the voting while Conan Byrne of St Pat’s was third. 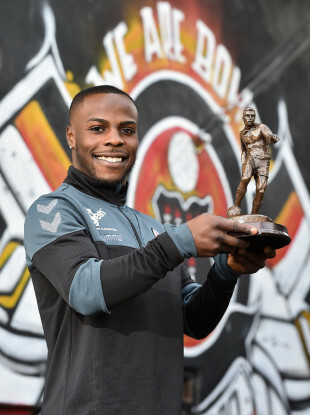 Email “Bohemians midfield general Fuad Sule has been named League of Ireland Player of the Month”. Feedback on “Bohemians midfield general Fuad Sule has been named League of Ireland Player of the Month”.